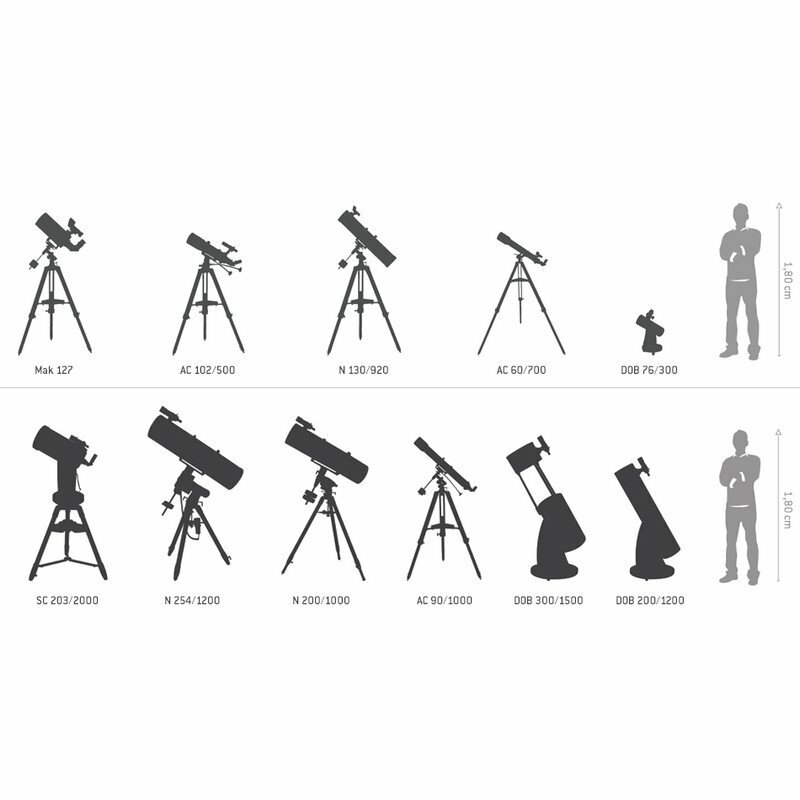 Dobsonian telescopes are among the most practical instruments in astronomy. They are of simple construction and yet a brilliant idea. They essentially consist of two parts: firstly the optics, which in most cases is a solid tube or truss tube design; and secondly the mount, a wooden box (also called a 'rocker box') which sits on the ground and into which the telescope is inserted. This design allows you to begin observing sessions immediately without first having to spend time setting up and aligning a complicated mount. The basic idea of the Dobsonian design came from the wish to have a big telescope at a low price, a wish that has succeeded brilliantly. A true fan base has developed since the invention of the Dobsonian telescope which is dedicated to these instruments and their fascinating simplicity and to the idea of 'high performance at low price'. The DOBSON telescopes from the house of SKYWATCHER convince by technical innovation and functional Design. A simple, elegant form of an alt-azimuth mount made to carry a Newtonian reflector was popularized by John Dobson in the late 1970's. In its simplest form, the Dobsonian mount consists of a box which allows the optical tube assembly to pivot in altitude, while the box itself is swivelled on a base in azimuth. Normally such mounts are moved by hand rather than motor driven. Their main advantages are low cost, fast easy setup and ability to make a mount big enough for larger tubes. The devices have handles, which are very useful both to transport and for adjustment the elevator axle. The telescope has a 2"-Focuser with adapter for 1,25"[ - ] like that is also a later ascent to 2"-Apex eyepieces without problems possible. Precision figured surfaces: the mirror of this telescope is made of BK7 glass and meets 75nm ptv or better, so the well-known precision condition Lambda/8 is more than satisfied. The telescope has a Strehl ratio of 0.8 or higher. This value expresses something of the optical performance and therefore the quality of the figured surfaces. When theoretically 80% of the light is incorporated in the Airy disk of the telescope image, the optics are described as 'diffraction limited'. That means that the resolution of a telescope is only limited by the diffraction of light. As it is not possible for this to be 100%, the definition of the diffraction limit has been set at 0.8. This always means that you have excellent optics (other systemic losses are not included here). 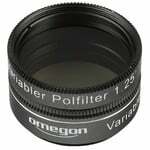 The 2" focuser is smooth and comes provided with a 1.25" reducer. 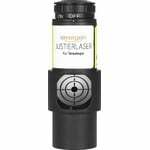 The finder scope has a fine crosshair, allowing easy location of even the somewhat fainter objects. 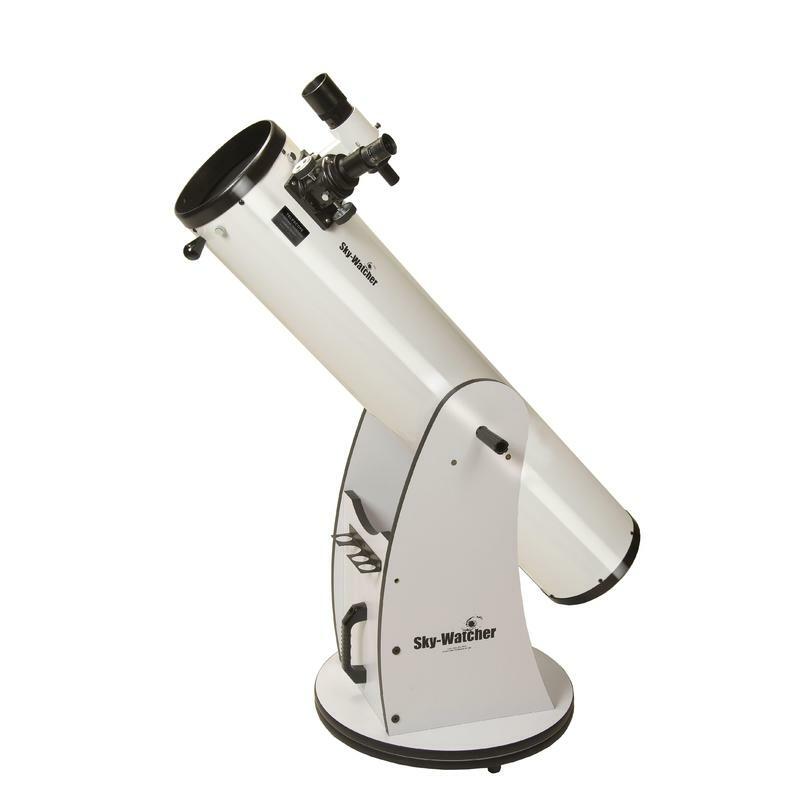 The Skywatcher rocker box is very easy to use. The telescope can be pointed in azimuth and altitude easily and smoothly by using only a couple of fingers. The telescope moves on slide and pivot bearings. It remains stable in any position, allowing highly enjoyable observing. And observing still remains a joy even at higher magnifications. The Tension Control System also lets you easily adjust the friction setting and so the amount of resistance when moving the optics on the rocker box. This allows you to always have the appropriate resistance set. Dobsonian telescopes offer a lot of telescope for the money. They are often purchased by beginners due to their simplicity and ease of use. Tracking is done manually. These instruments are primarily designed for visual observing. Their relatively large apertures mean you can resolve globular clusters and also see some structure in nebulae. Photography of the Moon and Sun are also possible with the appropriate accessories. Photography of other celestial objects requires a mount with tracking capabilities. This mount can be retrofitted later. The best investment i've ever made. I bought it last year in mid July and forgot to leave a Review. Dobsonians are Light buckets. You cant get a better price/performance ratio than this. The Oculars are not the best but they do what they do, and they do it great!. When comparing to my old 76/900, the 76/900 feels like it was a waste of money. This 8 inch Scope is by far the best thing a Beginner can get because: Its easy to assemble and it doesnt take long at all, again the price/performance ratio is AWESOME, It really doesnt need as much collimation as everybody will tell you, but you do need to collimate it before using it the first time. The Views are sharp clear and bright, You can do basic planetary imaging with videos and Its not really that heavy for 8 inch so you can carry it alone. You can start seeing detail and single stars in Clusters and Nebulas and you will be able to see Galaxys (most of them will be smeared grey blobs of light with halo around them). If you decide to buy it and take a look at Orion for example, make sure to have medics on your side because you may Pass out from the Beauty this thing will show you! I would reccommend to get the Basic Planetary Filters (Blue, Red, Green, Yellow) and a UHC Filter (tries its best to remove light pollution you may have) to enhace your views even further! 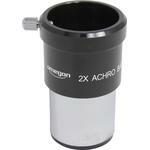 So if you want an awesome Telescope, definitely spend your money on this one!! What more can I say ... dobsonian light buckets for the win! That thing has brilliant mirrors for the price. Saturn, Jupiter, Mars, Moon... with a 5 mm good eyepiece... no worries in good viewing conditions the resolution is awesome! Wanna see the cassini division - BAM! Wanna see shadows on Jupiter of Jupiter's moons? - BAM! Wanna see the polar caps on Mars? -BAM! Awesome scope! Great optics! While having this scope I found myself wanting to take astrophotos, because I want to share my passion for astronomy and there aren't many that appreciate it whereabouts I live in Sweden. I just want to add that it IS possible to take astrophotos with this very model if you want to hook up your DSLR to the actual eyepiece. There is a guide on youtube showing you exactly that. Search under "Attaching an SLR camera to your Newtonian Telescope" made by the British "Astronomy and Nature TV." The Skywatcher has the advantage of being easier to modify (Quite easily) compared to e.g. an Orion telescope where you are forced to get a barlow lens and things get a biy shaky. This "Newt" gets 5/5 stars still, and as mentioned by other reviewers, just upgrade the accessories as you go along. The best accessory you can get is the "Telrad" finder- that is worth it's weight in gold and has saved many frustrating moments in case you are a beginner like me! Fear not, this is what you want. All i can say is, dont worry about your choice. Skywatcher is a great brand. I received my shipment yesterday and assembled it all tgthr. MIND YOU, the instructions are incomplete for the base of the dobsonian. You have to figure out some things yourself, so if you arent handy, then look it up on the net. IT wasnt hard to figure out. After some collimation (much wasnt needed) with my eye piece, I ventured out on my balcony (low light pollution) not expecting much, as it was a hazy night (only a few stars visible.) I point it in the SE horison and WOW! I have no idea what I saw (I think it was a deep sky object) but I couldnt stop looking at it. I would def. recommend getting some more eyepieces, perhaps a barlow x2 as well, as the scope can handle it. I totally agree with two other reviewers (Aki and Safiron). Highly recommend this scope. You get more with skywatcher than orion and the quality of what you can see is the same. Now I only think what other accessories to use, especially eyepieces. The fun just starts. It's my first big scope and I gotta say it's awesome. When I've decided to buy 8" Dob I basicly had two options: this scope and Orion alternative (in black). If you are where I was, then go for Skywatcher. It's cheaper you'll get better finderscope with slightly illuminated cross (Orion has Red-Dot), two eyepieces instead of one, and 2" extension tube. So in the end you actually get more for less money. No need to worry about quality I dont think Orion is made any better then Skywatcher It's just more expensive. If you're newcomer and this is your first scope or had a small 3" like me don't hesitate and go for 8". It's best compromise between price and performance. There is not much of the visual difference between 8" and 10" but It costs much more. 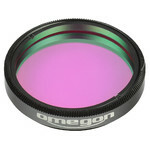 It's also large to transport, It has smaller focal ratio so you will more likely need coma corrector. So you will pay big mount of money for 2" of apeture. Believe me 8" is big enough. If you wanna go larger go for 12" or more. For the price, the view is marvellous. Galaxies down to magnitude 10 are visible in pitch-black skies with adapted eyes. The Azimuth movement is a little stiff, but not notably so; tracking planets at high powers is not difficult, but it is a bit jerky. 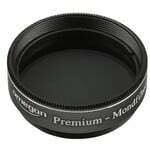 A good investment would also be a good 2" eyepiece, perhaps around 20mm-26mm, as the eyepieces included are a 10mm, 1.25" and a 20mm, 1.25". As telescopes go, though, it's tough to find a better deal if you're a relative newcomer. This is my second telescope, and it'll last me a long time. I only ordered this telescope after GSO N200/1200 Dob (with fine focus Crayford) was delayed a bit too many times. There is not much difference between GSO and Skywatcher - one is maid in China (GSO) and the other in Taiwan (Synta). Between them two they supply pretty much all commercial telescopes on the wast - they are just re-branded by different companies (Skywatcher, Orion, Celestron, Zhumell, Apertura ...). GSO and Synta dobsonians are neck and neck so it really doesn't matter which one you pick - the optical tube assembly (OTA) will be pretty much identical. So it's the accessories that come with them that put them apart (like fine focus Crayford on that GSO I wanted; but unlike Skywatcher it only comes with one eyepiece). Anyway, to the Skywatcher dobsonian 200/1200. I give it 4 out of 5 stars. 5 starts would mean that this product is perfect, considering cost and all. So let me tell you pros and cons and I'll start with the cons first. •low quality eyepieces that come with the scope. This telescope is capable of so much more than the original eyepieces that come bundled with it would lead you to believe. They are the cheapest kind you can find and really do no justice to the power of OTA. They are not even plossel. They will serve you OK at the beginning since you would not know any better, but you'll start thinking about replacing em very fast. •straight through finderscope. This this was made in hell. It will make you suffer, it will bring you pain. Why would they put this on a dobsonian I have no idea. I would much rather have nothing (and thus reducing price by 20-40€) than the finderscope that comes with this dobsonian. Just one night will be enough to convince you about getting right angle correct image (RAIC) finderscope and/or Telrad. •sticky base. It's just teflon pads so adjusting the telescope can be a bit annoying, especially at high power. GSO comes with roll bearings, but that's not perfect solution either. For this one you'll just have to mod it yourself (search the internet). •200mm primary mirror is big enough to really open a lot of night sky for you. Really only the dimmest DSO (deep space objects) will be out of your reach. Keep in mind that the stuff you'll be hunting for was discovered using much, much, much crappier telescopes. Good quality primary mirror is what you are paying for in dobsonian telescopes. Everything else is basic. This telescope will show you planets (rings and moons of Saturn even with the eyepieces that come with it), deep sky objects (galaxies, nebulas, clusters) and I don't even have to point out the Moon (which any telescope will produce good image of). •ease of use. This is basics, no computers, no alignment. You just place it on the ground and you are good to go. I personally enjoy the fact that there is no computer guidance - where is fun in that? Just type in the object you want to view and telescope will turn itself towards it. No thrill of exploration what so ever, no joy of learning the night sly on your own. By keeping it so simple there is really nothing to break or fail. So, final words. 4 out of 5 starts. If this telescope would come without finderscope and eyepiece, I'd give it 5 out of 5. So it's ironic that the accessories that are bounded with it bring the value down in my eyes. You'll replace the finderscope, you'll replace the eyepeices. Only thing that you'll keep is an OTA, and that's 5 out of 5!